A pretty quiet week, this time around, with just two films watched. This was down to two factors: firstly, I spent the weekend away in Suffolk, braving the subzero temperatures. Secondly, I've been watching a lot of Six Feet Under recently. I never saw the show when it was originally on TV, but I got the complete box set for Christmas, and have been working my way through it. I found it a little slow going at first, but it's really grown on me. Michael C Hall is a very fine actor indeed. This classic Ealing comedy is set during the Second World War, on the remote Scottish island of Todday. Here, the islanders are putting up with two wartime annoyances: Captain Paul Waggett, a petty and officious English captain in charge of the local brigade of the Home Guard, and the rationing of food and drink which has left them dangerously low on whisky. 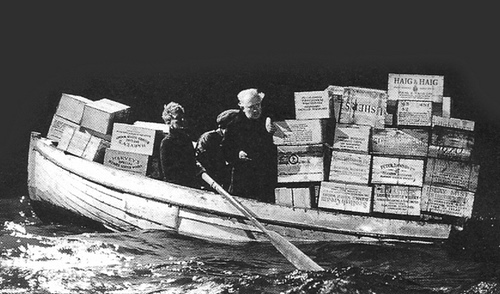 The islanders' prayers are answered when an ocean liner runs aground off one of the island's beaches, leaving behind a large shipment of sweet, sweet whisky. While Waggett attempts to ensure that the whisky is returned to the proper authorities, the rest of the Todday's inhabitants do their utmost to hide their recent gains. As with Passport to Pimlico, this movie is now a little dated, with the plotline reflecting the concerns of the British people, still forced to put up with rationing in the postwar period. Despite this, I found the movie to be charming and often rather funny, with particularly engaging performances from the likeable Bruce Seton (as an English sergeant stationed on the island) and the beautiful Joan Greenwood (as the postmaster's brassy daughter). Sam Raimi's hilarious follow up to the (also excellent) Evil Dead sees our much put upon hero Ash (Bruce Campbell) battling zombies in the woods all over again. Raimi doesn't try to reinvent the wheel here - the plot is very similar to that of the first movie, with Ash spending another night in the same accursed cabin, with horrible creatures attacking him and his friends left, right and centre. However, the increase in budget for this picture means that Raimi is able to be even more inventive with the gory special effects. Thus, we see such astonishing sights as Ash being attacked by his own hand, set upon by a hideous witch and a possessed redneck, and, at the end of the movie, being sent through time to battle the undead in the Middle Ages (which sets the stage for the concluding part of the series, Army of Darkness). 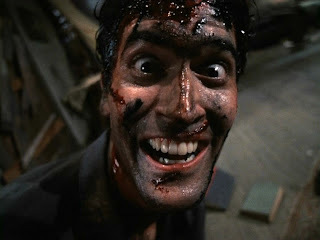 Bruce Campbell, in the lead role, does a tremendous job in taking all the punishment poor old Ash has to suffer, and he's a dab hand at dishing up a cheesy one liner with a knowing wink to the audience. I may have to revisit Army of Darkness before I can definitively say this, but for me, this is the best part of the trilogy, one of those rare horror films which manages to be both funny and scary at the same time.